business and back to yours? Want to get out of the IT business and back to yours? Most organizations–regardless of the size or maturity of their IT department–understand what it takes to run an IT operation. But even the most seasoned professionals hesitate at the prospect of bringing the Cloud into the mix. Faced with fears (however unfounded) like job loss, a forced retooling of staff, or added complexity that will bring more headaches than benefits, the first instinct is to shut the idea down completely. The bottom line, however, is that it is smarter to let Cloud experts take care of it so your IT staff can focus on more strategic initiatives. With AKA’s Cloud Operations Managed Services, our Azure experts take those tasks off your plate, freeing your IT staff to focus on your business. Regardless of the application, if it’s part of your infrastructure running on Azure, we can handle it. 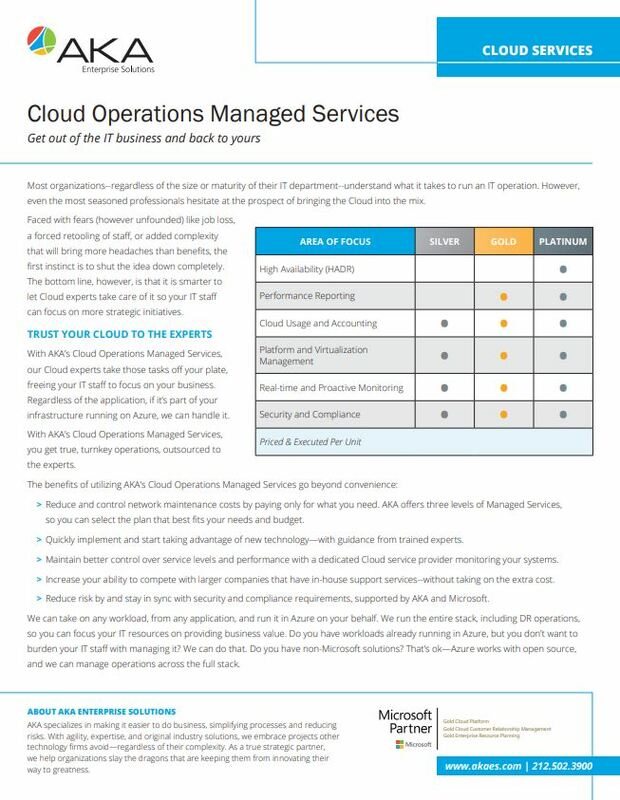 With Cloud Operations Managed Services, you get true, turnkey operations, outsourced to the experts. Reduce and control network maintenance costs by paying only for what you need. 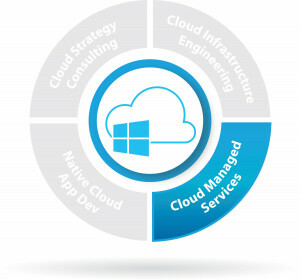 AKA offers three levels of Managed Services, so you can select the plan that best fits your needs and budget. Quickly implement and start taking advantage of new technology—with guidance from trained experts. Maintain better control over service levels and performance with a dedicated Cloud service provider monitoring your systems. Increase your ability to compete with larger companies that have in-house support services—without taking on the extra cost. Reduce risk by staying in sync with security and compliance requirements, supported by AKA and Microsoft. We can take on any workload, from any application, and run it in Azure on your behalf. We run the entire stack, including DR operations, so you can focus your IT resources on providing business value. Do you have workloads already running in Azure, but you don’t want to burden your IT staff with managing it? We can do that. Do you have non-Microsoft solutions? That’s ok—Azure works with open source, and we can manage operations across the full stack. We also offer other managed services, including setting up Office 365, SharePoint, and mailboxes, provisioning in Power BI, and managing licenses.